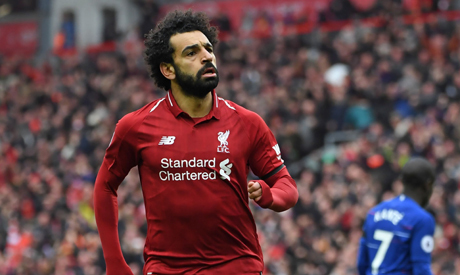 Egyptian winger Mohamed Salah moved back to the top of the Premier League scoring chart after netting against Chelsea in a 2-0 victory on Sunday, and he did it in style. The 26-year-old forward fired a screamer from 25 metres out into the far top corner to net his 19th goal, moving on level with Manchester City striker Sergio Aguero. "I don't think, I just feel! Normally I shoot [with the] inside of the foot but this one - because it's far [out] - I just hit it with power. I was a bit lucky that the ball hit the net like that," Salah told Skysports after the game. Liverpool's coach Jurgen Klopp was delighted by his team's performance but was quite impressed by Salah's goal. "It blew me away. I was really happy. I saw it really well; maybe I saw it first the ball would go in. It was a really, really outstanding finish," he said after the game. It was arguably Salah's best goal of the season but he doesn't see it as the highlight of his career. "I will always chose [the Everton] one," he added. This is my favourite because it's my first derby. I think I used everything good - the strength, the technique and the skills." Salah's curling shot against Everton won him the 2018 Puskas award. Liverpool are now back on top of the Premier League, two points ahead of defending champions Manchester Cit who have a game in hand.